Frozen strawberries: a versatile ingredient. Photo courtesy The Perfect Pantry. 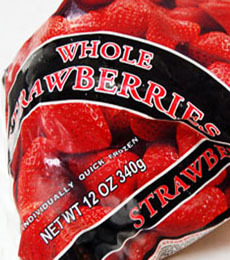 Stock up on bags of your favorite frozen fruits. They’re less expensive than fresh fruit. Beyond fruit desserts and snacks, you can use them for cold soups, with stewed meats, in marinades and much more. 1. SLIGHTLY THAW frozen fruit. 2. COMBINE semi-melted fruit and your favorite fruit juice, spritzer or juice cocktail in a blender. Press “chop” a few times until the mixture is smooth but still has visible chunks of fruit. 3. TRANSFER into ice pop molds and freeze. For more frozen dessert ideas, take a look at THE NIBBLE’s Ice Cream section. *The generic term is “ice pops”: Popsicle is a trademark of the Unilever Corporation. However, many people can’t make the transition from brand to generic. The same is true with Kleenex, the generic of which is facial tissue.